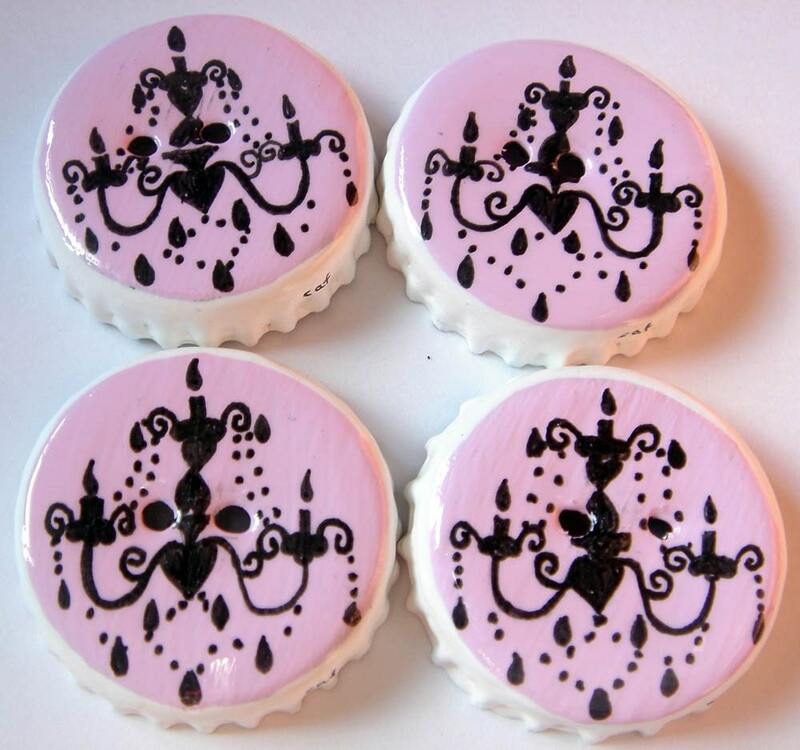 This week's EtsyInspired artist is Kim from Circles are Forever. I just love Kim and I find absolutely nothing wrong with featuring someone who is as kind as Kim and adds so much to the Etsy community. If you are on Etsy, you know what I mean! Kim is AWESOME! Now, Kim AMAZES me. I cannot draw or paint. It's just near impossible for me. Kim can. Not only can she paint but she can paint BEAUTIFUL masterpieces on little itty bitty bottle caps! How amazing is that? I can't imagine the preciseness and attention to detail that would take. Definitely not something I could ever do. Plus, how awesome is it that she upcycles something that you would normally throw away? She makes earrings, buttons, push pins and all sorts of wonderful stuff for her shop. AND this week, Kim is giving away this gorgeous pink and orange ornament set to only lucky person who enters. All you have to do to win is make a creation based on ANYTHING in the Circles are Forever shop and link it here. You have until Monday, Oct 20th at noon Pacific time to have your creation linked. 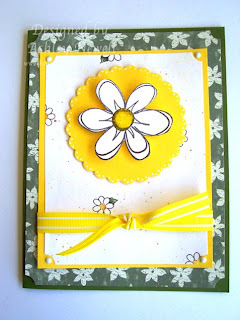 You can make anything your little heart desires ie a card, tag, layout, painting, sculpture, etc... It can be anything as long as it's handmade by YOU! This week I'm offering everyone an extra entry into the drawing (random drawing this time) if you link this post on your blog or in your gallery. Just give me the link and you'll get your extra post! This is my card. It is based on THIS set from Kim. There was so much good stuff to choose from in Kim's shop! I think everyone would be able to find inspiration there since there's a wide variety of items. Since I am a tiny bit tired from the events that took place on Monday, this week I'll just be linking all the design teams creations. You should check them ALL out! They are fabulous as always. Actually REALLY more fabulous this week, I think. Great card Ashley. Hope the little guy is feeling okay. I love your flowery goodness! Get some rest! the card is way--- cute! best wishes in the contest. Ashley - totally love this card!! Daisies are one of my favorite flowers. Your layout is perfect to showcase this beauty!! Really pretty card! I need to break out my yellow paper, I seem to forget about it. Those are super neato!!! Kim is uber talented and tfs her art with us! I love the card she sent you too! :) You are so sweet! This is so flippin' cute! I love the bright cheery feel of this card! I love the little itty bitty bottle caps! Awesome artist ! I love this challenge and her work is so cute and funky! Will try and make a card for the challenge over the weekend. Wow, these are very nice!